Doing these types of articles always make me really hungry. Today I found out the history of Reese’s Peanut Butter cups. 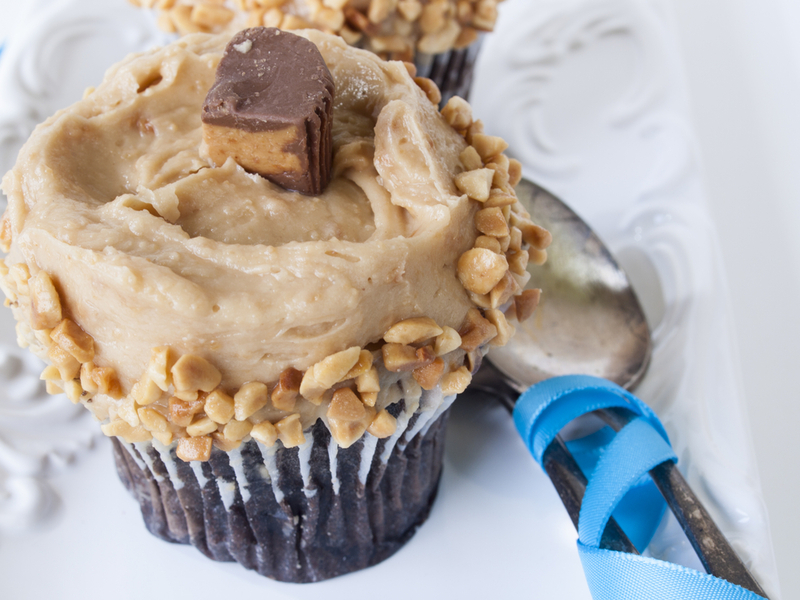 A popular chocolate cup filled with delicious peanut butter, Reese’s Peanut Butter Cups were created by a man named Harry Burnett (H.B.) Reese. Reese was born May 24, 1879 in Pennsylvania to a farming family. He married in 1900 and went on to have sixteen children. (Yes, 16!) By 1903, not surprisingly, he was struggling to support his growing family, so took on all manner of jobs from butcher to factory worker. In 1917, Reese found an advertisement to work on a dairy farm owned by Milton S. Hershey, owner of the Hershey Chocolate Company, in Hershey, Pennsylvania. Though he didn’t know it at the time, taking the job would shape the rest of Reese’s future. He worked on the farm for several years and later began working in the company’s chocolate factory, where he became inspired by Hershey and set out to make his own chocolates. Initially, Reese considered his chocolate venture to be a means of providing a little extra money for his family. He started creating confections in his basement, naming bars and candies after his many children. He used fresh ingredients for his candy creations, along with a large quantity of Hershey’s chocolate. In the 1920s, Reese’s basement-born enterprise was doing much better than expected, with the candies selling successfully to the local market. He decided to take the business even more seriously and set up the H.B. Reese Candy Company. In 1928, Reese also started selling chocolate and peanut butter confections he simply called peanut butter cups or “penny cups” as they cost just one penny each at the time. They were so successful that Reese was able to sell five-pound boxes of the cups to local retailers for their candy displays. Reese was soon able to quit his job at the Hershey factory to concentrate on his own business. He even built a 100,000 square foot factory on Chocolate Avenue in Hershey, Pennsylvania, making a wide assortment of candies including raisin clusters and chocolate covered dates. However, during World War II, Reese was forced to abandon his other projects due to scarcity of supplies and economic hardship. He chose to focus solely on his peanut butter cups, which were his most popular product, and the investment paid off. Unfortunately, as his cups were growing rapidly in popularity, Reese died unexpectedly of a heart attack in 1956, just a few days before his 77th birthday. Seven years later, six of Reese’s sons decided to sell the family business. The Hershey’s Chocolate Company, that had inspired Reese, purchased the H.B. Reese Candy Company for $23.5 million in 1963 with H.B. Reese’s children getting roughly a five percent share in the Hershey Company (which is today worth about $20B, 5% of which is $1B). Reese’s Cups continued to prosper under Hershey’s. There have been dozens of variations on the candy, including “big cups,” miniatures, and minis, as well as dark chocolate, white chocolate, caramel, marshmallow, and hazelnut cream flavours. Other variations include Reese’s cookies, Reese’s Pieces, and Reese’s Puffs Cereal (of the “It’s Reese’s for breakfast!” fame—promoting “healthy” breakfast options for children everywhere). The candy is now available in many countries around the world and enjoyed by millions of people every year. Starting from its humble beginnings in the basement of a determined entrepreneur just looking for a way to support his enormous family, it’s now an extremely popular candy, counted among the top ten favourite chocolate treats in the U.S. Contrary to popular belief, George Washington Carver did not invent peanut butter. The earliest known people to make such a paste out of peanuts were the Ancient Incas around 1000 BC. Reese’s Peanut Butter Cups are most popular in America. In Australia, they can only be found in specialty candy stores that sell other American candy. Recently, Hershey’s products were made available in Tesco stores across the UK. The cups are a recent sensation in Japan, where they were previously only available on U.S. Army bases. Hershey began selling its products in Seiyu, the Japanese branch of WalMart, where Reese’s cups have now become wildly popular. The cups are the top selling chocolate in Seiyu, selling 1.7 times more than the runner-up (KitKat minis). Reese’s Peanut Butter Cups sold overseas have just one difference from those sold in the U.S.- they don’t contain a type of preservative called tertiary butylhydroquinone, or TBHQ. The preservative isn’t even approved for use in Japan. The controversy surrounding the compound is that in doses above .02% (the FDA allowed concentration in food), it has been shown to damage DNA and cause the precursor to stomach tumors, among other issues. However, studies seem to indicate at the allowable levels found in various food items, like Reese’s Peanut Butter cups, there shouldn’t be any adverse effects. Milton Hershey was said to keep a stash of peanut butter cups in his desk. He saw Reese as a customer rather than a rival because Reese used Hershey’s chocolate for his peanut butter cups. Reese is buried in the Hershey Cemetery just meters away from Milton Hershey’s grave. Reese’s makes so many peanut butter cups each year that it could feed one cup to every person in the USA, Europe, Australia, Japan, China, Africa, and India with its annual production. May 18 is the official “I Love Reese’s” Day. It was established after nearly 40,000 fans joined a campaign page on Facebook asking for their favourite candy to have its own special day. Reese’s Peanut Butter Cups are one of the most popular candies sold during the Halloween season, ranking behind candy corn and Snickers. (KitKats and M&Ms round out the top 5). The cups are available in different shapes during different holidays, including a heart for Valentine’s Day and pumpkins for Halloween. For the release of The Dark Knight in 2008, Reese’s even came out with a limited edition cup in the shape of the Batman logo. Though it’s certainly a treat, Reese’s Peanut Butter Cups also contain a modicum of positive health benefits to go along with the negative: depending on the size, they contain roughly 5 grams of protein and also have some iron and calcium. If you’re looking for a more in-depth overview of the History of Reese’s than is appropriate for an article like this, Andrew R. Reese, the grandson of H.B. Reese, has written a book titled Reese’s Peanut Butter Cups: The Untold Story. The book was published in 2008 and contains details of Reese’s life and the invention of the peanut butter cup. I’m bummed to find out it was not invented when someone carrying a chocolate bar bumped into someone carrying a jar of peanut butter and the chocolate bar slipped and fell into the peanut butter jar. Classic case of advertising fraud…. All I can say is mmmmmm! I agree with Shawn…those commercials were so cute! Too bad Hershey’s has cut corners with their peanut butter cups, adding filler to the very small amount of peanut butter still present. The milk chocolate isn’t quite the same as it used to be, either. I love the peanut butter in it, even if they do use filler. But they did change the chocolate maybe some 10-20 years ago. I used to love the crispiness of the chocolate and would by Reeses cups routinely. Now the chocolate is like a rich mushy paste. So sad. Now I enjoy them only marginally compared to what they used to be. I need to find out where I can get my hands on some European Peanut Butter Cups that don’t contain TBHQ! Why in God’s name do they put that poison in my candy in the first place?!?!? When I was a young child in the late 60’s early 70’s my Mom used to buy Reese’s in a large box that had like 24 or maybe 48 cups per box. Is there anyone else who remembers these boxes and are there any of these boxes still around that someone kept as a memento. I would love to see one of these and especially like to see how much an individual cup weighed back then. Those were the small Reese’s cups. My mother used to buy them, too, they came in a box with two levels. Delicious! At .55 ounces, they seem quite a bit smaller than the original ones.